Essex Lodge, 1792 to 1837; 1845 to the present. Starr King Lodge, from 1864 to the present. Work has commenced upon the remodeling of Kinsman Hall, in Salem, Mass., as an asylum for the different Masonic bodies in that city. There is to be a banquet hall 45 by 26 feet, with a capacity for from 250 to 300 persons, a large hal1 45 by 37 feet, with 1665 square feet of floor surface for the lodges, anterooms for Essex Lodge, Starr King Lodge, Washington R. A. Chapter, Salem Council R. and S. Masters, the Lodge of Perfection, and Winslow Lewis Commandery, K. T., including an armory for the latter. The armory will be 29 feet by 19. There will be a parlor, smoking-room and other convenient features. The finish will be ash, and the frescoing very elegant. The rooms are to be ready for occupancy October first. The new and elegant home of the Masonic craft in Salem in the former Kinsman Hall on Washington Street was dedicated on Wednesday evening, January 13th, by Most Worshipful Abraham H. Howland of New Bedford, Grand Master of the Grand Lodge of Massachusetts. The ceremonies were open only to members of the fraternity. The Grand Master was accompanied by the following suite: Right Worshipful William T. R. Marvin, Senior Grand Warden; R. W. George W. Storer, Junior Grand Warden; R. W. Charles A. Welch, Past Grand Master; R. W. Charles C. Dame, Past Grand Master; R. W. William Parkman, Past Grand Master; R. W. Henry Endicott of Cambridge, Past Senior Grand Warden; R. W. Nathan S. Kimball of Haverhill, Past Junior Grand Warden; R. W. William H. H. Soule, Past Junior Grand Warden; R. W. Ivory H. Pope, Past Junior Grand Warden; R. W. William F. Salmon of Lowell; R. W. Sereno D. Nickerson, Grand Secretary; R. W. Samuel Wells, Grand Treasurer; W. Rev. Fielder Israel, Grand Chaplain; W. Charles Harris of Boston, Grand Marshal; W. Charles M. Avery, Grand Lecturer; R. W. Dana J. Flanders of Haverhill; R. W. Oliver A. Roberts of Salisbury, District Deputy Grand Master of the Ninth Masonic District; R. W. Ambrose Webster; R. W. Columbus Corey of Malden, District Deputy Grand Master of the Seventh Masonic District; R. W. Charles H. Norris of Salem, District Deputy Grand Master of the Eighth Masonic District; W. Henry J. Parker, Grand Tyler. 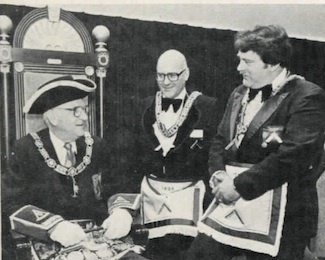 The ceremonies of dedication began at 7.30 in the presence of a large and distinguished company of the craft, numbering between two and three hundred Masons. Among those present were the Hon. Caleb Foote, the oldest living Past Master of Essex Lodge of Salem, of which he was Master in 1829. The venerable Samuel Buttrick, Past Master of the same lodge, was prevented by the infirmities of his years from being present. The Temple Quartette of Boston was present and sang several selections. The beautiful lodge room was decorated in fine taste by McGee & Geary, florists. At the conclusion of the impressive rites, the officers of Essex and Starr King Lodges were successively installed, Horace N. Smith being Worshipful Master of the first, and John Pollock Worshipful Master of the second. After the ceremonies, there was a banquet by Caterer Killam, followed by speeches by the Grand Master and distinguished guests. Masonry had its origin in Salem in a company of shipmasters who used to frequent the Old Sun Tavern on Essex Street in the latter part of the last century. Essex Lodge of Masons was erected in 1779, but in 1789 surrendered its charter on account of the absence of its members at sea. In 1791, a new charter was obtained, and the lodge finally instituted. It continued till 1833, when its communications were interrupted by the anti-Masonic excitement, and the Work of the lodge was suspended until 1845, since when it has continued. Its roll of members embraces some of the most distinguished men who have made Salem historic. Washington R. A. Chapter was formed in 1811, Starr King Lodge in 1865, Sutton Lodge of Perfection A. A. S. R. in 1864, and Winslow Lewis Commandery followed. The lodges met in Franklin Building, then in the Chase Block, where the Holyoke Building now stands, on Washington Street; then in Asiatic Building, in Odd Fellows' Hall, and since 1875, in the hall just quitted in Downing Block. The present hall was remodeled this last summer, and furnished at an expense of $3,000. The suite embraces a spacious lodge room, elegantly carpeted, and furnished with rich mahogany furniture, upholstered in wine-colored embossed velvet plush. The walls are tinted in neutral buff tints, and beautifully frescoed. The ceiling represents the blue vault of Heaven. The entrance to the Temple, "Jachin " and "Boaz," St. John the Baptist and St. John the Evangelist, all are depicted upon the walls. The whole effect is exceeding!) attractive and elegant. The windows are ornamented with cathedral glass, and the apartment is lighted by a magnificent polished brass chandelier. There is a richly furnished reception room, committee rooms, and an armory and asylum for the Knights Templars. The craft in Salem have now an exceedingly sumptuous home. The banquet hall will seat one hundred and fifty persons. — Boston Journal. SALEM'S NEW MASONIC HALL ASSURED. The new Masonic building proposed for Salem may be regarded as assured, unless the owners of the lots desired hold their property at prohibitive prices. One location which was recently offered to a club for headquarters at $47,000 is now held at $65,000. This is because the owners are interested in other estates in the vicinity and think such a building as is proposed to erect for a Masonic hall will draw tenants from these less modern buildings. The stock for the new edifice is practically subscribed. Salem, Mass., Masons are to have a new temple which is already in use though not completed or dedicated. The first meeting was held by Essex Lodge, May 2d andd was largely attended by members and visitors. A supper was served in the banquet hall on the seventh floor to 400 Masons. The honor of inducting the first candidate into the order in the new quarters fell Right Worshipful George B. Farrington of Salem, who was assisted by officers of the Starr King Lodge of Salem. Among the features of the new temple is an Estey organ that cost $3,000, the armory of the Winslow Lewis Commandery, and a room in reproduction of a room in Westminster Abbey. The formal dedication will take place on St. John's Day, June 24, when exercises will be conducted by Grand Master Johnson of the Grand Lodge of Massachusetts. The dedication will take place one year from the date of the laying of the corner-stone by Grand Master Johnson. The fine new Masonic Temple at CD Salem, Mass., was dedicated with imposing ceremony and in the presence of a large assembly by the officers of the Grand Lodge of Massachusetts, Saturday, June 24th. This event was exactly one year after the corner stone of the building was laid by Grand Master Johnson. Previous to the dedicatory exercises a delightful luncheon by Bro. Schleuber of Lynn, was served to the officers of the Grand Lodge, the officers of Essex and Starr King Lodges, the past masters of each of these lodges, the presiding officers of each Masonic body in Salem, the officers of the building association, and those prominent in the work of building, together with the masters of sundry lodges in the vicinity of Salem. Promptly at 3 o'clock, George W. Blinn, W. M. of Starr King Lodge called that lodge to order and it was organized, followed a few minutes later by Harry P. Gifford, W. M. of Essex Lodge, who likewise organized that lodge. The presence of the Grand Master was then officially made known and he with his suite was received with honor clue their stations. The visiting party was made up as follows: Melvin M. Johnson, G. M.; Wm. H. L. Odell, D. G. M.; H. P. Ballard, acting S. G. W.; Roscoe E. Learned, J. G. W.; Charles H. Ramsay, G. T.; Frederick W. Hamilton, G. S.; Rev. R. Perry Bush, D. D., G. C.; Wm. M. Farrington, G. M.; Frederick L. Putnam, G. L.; Charles T. Cottrell, J. G. D.; Charles H. Marble, J. G. S.; Arthur A. Sondheim, J. G. S.; Theodore L. Kelley, G. S. B.; Lewis M. Witherell, G. P.; George W. Chester, G. Tyler. Accompanying the grand master and his suite were the following members of the grand lodge: J. Albert Blake, P. G. M.; Charles M. Green, P. D. G. M.; Rev. W. H. Rider, D. D., P. D. G. M.; James M. Gleason, P. G. W. William F. Davis, P. G. W.; Frank W. Mead, P. G. W.; Wm. M. Belcher, P. G. W.; Charles S. Robertson, P. G. W.; Henry J. Mills, P. G. W.; Albro A. Osgood, P. G. W.; George B. Farrington, D. D. G. M.; Benjamin B. Gilman, D. D. G. M., and Gardner R. P. Barker P. D. D. G. M.
After the visitors had been received Grand Master Johnson tool charge of the proceedings and officially dedicated the temple to the uses of Freemasonry, with the ancient rite which have so many times been performed, but which never were witnessed by a more attentive audienc than on this occasion. Every inch of space that could be used in the handsome lodge room was occupied by spectators, over 600 members of the local and lodges from the surrounding places witnessing the dedication. The music for the occasion was furnished by the Weber Male Quartet composed of A. C. Prescott, A. F Cole, G. H. Woods and W. E. Davidson. The dedication ceremonies over. Wor. Bro. John M. Raymond was introduced and presented to the building association a handsome stand of silk colors, the National and State flags. His presentation address was patriotic to the core and was loudly applauded at the end. The handsome gift was received by Grand Master Johnson in a speech enthused with patriotic fervor. The address wa punctuated with applause, and at H~ close enthusiasm rose to a high pitch, as the handsome organ pealed out the Star Spangled Banner, and every one of the people gathered in that hall sung that grand old tune in a manner that was inspiring. It was an occasion that will linger long in the memory of those fortunate enough to have been present. Hon. William H. Gove, president of the building association, received the flags from the grand master and they were promptly placed in position at the main entrance to the building and •were seen by several thousand who visited the temple in the evening. Grand Master Johnson then presented Wor. Bro. George L. Hyde and Bro. George W. S. Rollins each with a Henry Price medal. Henry Price was the founder of Masonry in Massachusetts and these medals were presented the two brethren because they have been members of the Masonic fraternity for 50 or more years. Each recipient was given a fine reception. The ceremonies being over the lodge was closed and the company proceeded to inspect the building. During the evening more than 2000 persons passed through the Masonic quarters. Reaching the upper part of the building by elevator the tour of inspection began with the Armory of Winslow Lewis Commandery, K. T., passing from there to the corridor and then into the handsome room which was taken from the old Peabody mansion, the former Cadet armory. The visitor next inspected the chapter room and the sundry anterooms, and then arrived at the lodge room, which was the centre of attraction. The lodge room is painted white, with mahogany furniture and delf Wue carpet and trimmings. The lighting effects were demonstrated by Wor. Bro. Harry Kingsley and others, .they being shown to their best advantage. The lighting in itself is an attraction. At the handsome $3000 organ sat, at various times during the afternoon and evening, Messrs. Sonier and Sawyer of the Estey Organ Co., and Organist J. Frank Ross of Danvers, who played selections that brought out the beauties of this handsome instrument. The banquet hall is on the fifth floor. On this occasion a dainty buffet lunch was served by Caterer Schleuber. From the banquet hall the visitors returned to the main apartments by an entirely different route, each man receiving a miniature trowel as a souvenir of the occasion. The affair was finely managed, and the big crowd was handled without confusion, the result of the efforts of a committee composed as follows: W. M. Harry P. Gilford, S. W. Adelbert Dennett and J. W. Frank T. Goodell of Essex Lodge, and W. M. George W. Blinn, S. W. Harry W. Kimball and J. W. Walter B. Edgell of Starr King Lodge. Many ladies were present in the evening. Some of them wore elaborate gowns and all were charming accessories of a delightful occasion. A large delegation of Masons from Essex and Starr King Lodges Sunday, June 25th, completed the observance of St. John's day by attending services in the South church, where a sermon was preached by the pastor, Rev. Thomas G. Langdale, who is also chaplain of the Starr King Lodge. "Solomon's problem is ours. To live in peace with our fellow men and do our duty to the world, so combining the two that the one shall not interfere with the other. Its seeming simplicity is not the least of its difficulties. We live in conditions where God's claim on us for righteousness must come first, and where our consciousness of sin forgiven is the starting point of a broad inclusive brotherhood that makes us akin to all with whom we have to do, without regard to the outward circumstances of our lives. It was to this end that the Master of man, the Lord Jesus Christ, took upon him a human form and became obedient unto death, that through him we might be led to serve our fellowmen where we are and as we find them. "An illustration of the practical working of this spirit is seen in the work of the churches and of the Red Cross in the different countries of stricken Europe, and co-operating with them beyond what is commonly known, Free Masonry has played an important part. "Today in the midst of the world's strife, our churches and lodges and social orders of many descriptions an living in a degree of harmony perhap never equaled in the world's life. We are at peace with one another an< our only emulation is in good work by which we may raise to a higher plane the common life of men, eacl doing its part, each contributing it share. It is not that we lack peace, but rather that good spirit whicl makes our life a unit and which tht world sadly lacks. I commend to you as I commend to myself the recognition of the primal need of God's for giveness for our personal sins, ii. order that we may have a broad charity for others; and having learned the secret of good will ourselves, to pass it on to the next man. who is our touching point with tht universe." "Raised from the Ashes ..." is a beautiful, new Masonic Temple building in the town of Salem, Massachusetts, after a disastrous fire had wreaked havoc and totally destroyed the Temple in the George Washington birthday conflagration in 1982. Many dedicated Masonic brethren put their collective shoulders to the wheel and, literally, the edifice rose from the ashes and is now the home of our Masonic bodies in this historic community. Rebuilt, and occupied once again, the Temple was re-dedicated in a ceremony conducted by the Grand Master and the Grand Lodge officers on June 10th, 1984. The picture shows the Grand Master, M. W. David B. Richardson, seated in the Master's chair which had been given to Essex Lodge in 1850 by Wor. Benjamin F. Browne, who was Master in 1824-1827. Located in a small Lodge hall toward the rear of the Temple, this chair was one of a very small number of items that escaped destruction. 01/13/1886: 1886-1; Hall dedication, at a Special Communication. 06/24/1915: 1915-185; Corner-stone laying, at a Special Communication. 06/24/1916: 1916-275; Hall dedication, at a Special Communication. 06/10/1984: 1984-43; Rededication of Temple, at a Special Communication. This page was last modified on 19 June 2016, at 22:10.